The official countdown to the opening of Proenza Schouler’s first ever brick-and-mortar store is almost over, and with less than 24 hours until the doors open, we’re happy to bring you some inside deets to curb your sartorial appetite until you can browse the racks yourself. Located at 822 Madison Avenue, the shop is a much-celebrated edgy addition to the sometimes-stuffy Upper East Side. When speaking with WWD, designer Jack McCollough referred to the store as being, “made out of sidewalk,” in reference to the shop’s floor to ceiling concrete walls and dark pipe fixtures. 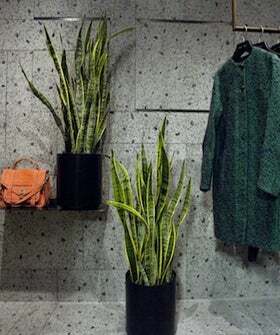 But, this boutique isn’t all 50 Shades of Grey — a few cactuses have been strategically placed around the shop to give the space a slightly greener atmosphere.